These trails extend throughout the land formerly owned by James and Phyllis Farmer. The land is administered by the Water, School and Highway Departments and the Conservation Commission. Long-time residents often refer to this area as the Farmer Parcel. Several interesting loops are possible, with the most interesting ones encompassing the architectural highlights: a sturdy stone lintel bridge, a complex building foundation and a small but magnificent stone chamber built into a hillside. There is a large sandy area south of the main trailhead. This is the remains of the sand quarrying that occurred during much of the mid 20th century. The sand was deposited by glaciers, and what remains are steep hillsides and some mounds of stabilized debris. A network of ATV trails covers this area and if you’re unfamiliar with it, it is best to turn right up the hill to do your loop counterclockwise. The trail parallels the edge of the quarry, with a few excellent views to the south. One of the viewpoints is next to a stone boundary marker. See if you can identify your location on the map. The trail soon descends steeply and you should watch your footing on the leaves. Near the bottom it turns left to parallel a stream at some distance, crosses a stone wall, and ascends abruptly to the edge of undisturbed land. The trail then enters a pine forest, a fine example of a succession forest, which evolves from a disturbed area by initially favoring a monoculture of a fast-growing species attuned to the soil, moisture and microclimate. Keep to the right at junctions to arrive at the stone lintel bridge, which blends into its environment so well that you may not notice it until you realize you’re crossing a stream. Take some time to examine the sides to see the care and effort involved in its construction. Perhaps an early road went through here, or a settler used it to access his crops or pasture. Now keep to the left at junctions. You may miss the foundation tucked into the forest on your left, but the stone chamber is right by the trail. Examine its interior and marvel at the stone roof and the delicate construction of the pillar. There were lots of mom-and-pop granite quarries in Westford, and these stones likely came from nearby. There are plenty of theories about the purpose of this building, from root cellar to dynamite storage. Maybe you can solve its secrets. The nearby foundation has a zigzag footprint, as though it started small and was enlarged in stages. It’s too small for a house, so it may have been another storage building. Continue south to the Dog Pound and the old highway garage. You can cross the pavement directly to the old trolley line, or go left before the debris mounds to follow a narrow trail that skirts the forest and swamp. The trolley line used to run from Ayer to North Chelmsford. Today it can be followed from the end of Beacon Street to Route 40 near Forrest Road. Turn left onto the old railbed. When you come to the road on the left, you can follow it to the Cote pump house and take the trail at the end of the cul-de-sac to return to the trailhead. 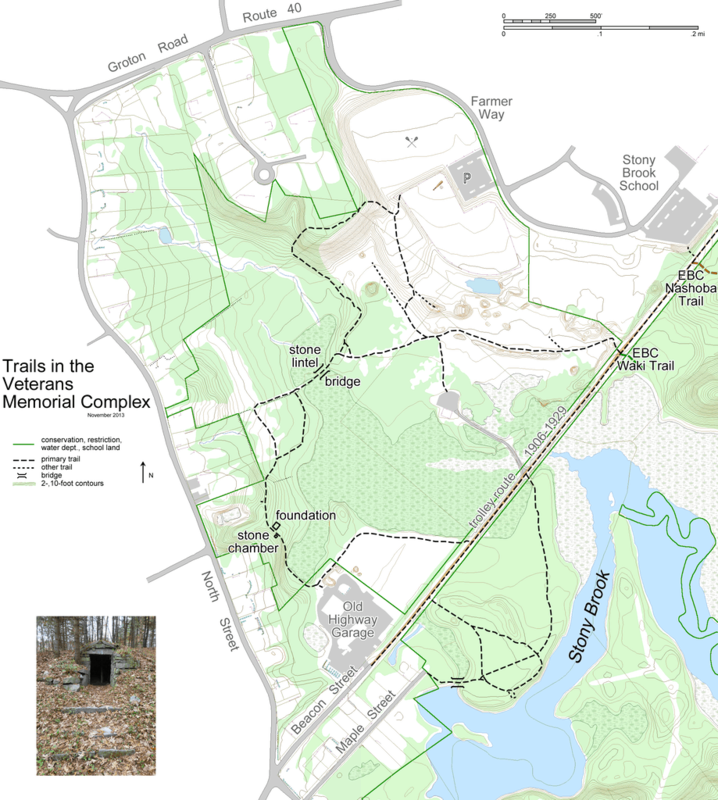 Use the map to navigate through the complex trail network. Opposite the road is a trail to the Stepinski well and pump house. Near the building are multiple trails through and around an open area. If you always stay to the left, toward Stony Brook, you’ll eventually come to the end of Maple Street. Or continue on the trolley line to a slightly longer return route. A trail goes left through high brush and then open sand. You can also turn right to the Waki Trail in East Boston Camps. Or go farther up the trolley line to a short tail on the left that climbs to the Stony Brook School parking lot, where you can walk Farmer Way back to your car. Parking is best at the athletics fields of the Veterans Memorial Complex on Farmer Way. From there, descend the steps and follow the fence past first base to an opening at the corner.